Amidst the sweet aroma of pan dulce, Leticia Ortiz was busily working at her job at Panaderia Celaya in central Los Angeles one day when she saw a friendly and familiar customer entering the bakery. While she had seen Señor Edmundo in his wheelchair before, this day was different, as she spotted him trying to stand from his wheelchair and hold onto a door. It was then that she noticed that the seat of his wheelchair was constructed from a piece of an auto part. “I asked him if he always sat in that wheelchair and he said, ‘Yes.’ He is paralyzed over 50 percent of his body, so he could only use his one good hand to help maneuver the wheelchair. When he left the bakery, I started thinking that I had to do something to help him,” said Ortiz. Luckily, Ortiz knows a thing or two about rising to the occasion to help her community. She’s been a part of the Neighborhood Leadership Group (NLG) in the Best Start Metro LA community for five years now. Every Thursday, they hold a meeting at Richardson Park, where they collect and share information on local family-oriented resources, including financial and health resources. Together, they’ve learned to mobilize concrete supports crucial for family stability, such as helping someone who is unemployed pay their rent, or helping each other when a parent is ill. It was this learned resourcefulness and her quick thinking that led Ortiz to post Señor Edmundo’s photograph and story on her personal Facebook page, where she tagged her Best Start friends and asked if anyone knew where the group could purchase or find a donated electric wheelchair. Soon enough, there were leads and three different options. 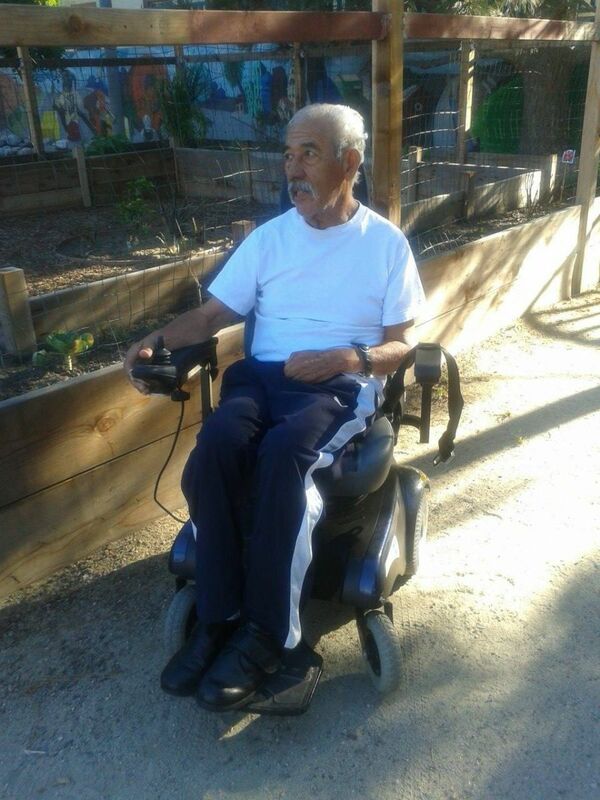 Ortiz and the NLG Best Start Metro LA group held a vote and decided to collect money to help purchase the electric wheelchair. Together with the help of donated funds from her coworkers at the bakery, they made it happen. “One of our NLG Richardson park members knew of a lady who was selling her wheelchair. Everyone gave what they could out of their own pockets, and we paid for it in two separate installments,” said Ortiz. “We invited Señor Edmundo to the park and there, under a large tree, we presented him with his new electric wheelchair. He was so happy,” she added. “The NLG’s realize they have an opportunity to connect to other people. The meetings provide the space for the community to meet and chat with their neighbors about the challenges that they are facing. They listen to each other, express themselves and collaborate on finding solutions,” said Brenda Aguilera, Director at Para Los Niños and Best Start Metro LA. In order for young children to succeed, communities and neighborhoods need to be safe, healthy places where families can thrive. That’s why First 5 LA is working with parents and community leaders to build these connections. “This community is in a different place now. This is a family, and we see this in the way they help each other through the good and bad,” said Aguilera.